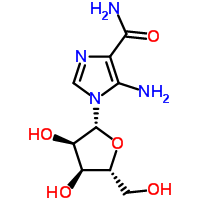 Researchers from University of Leeds have found drugs such as antidiabetic drug Metformin (right structure) and AICAR, (5-Amino-4-imidazole carboxamide ribonucleotide) below right structure) used to combat obesity, can prevent the hepatitis C virus from replicating in the body. Drugs such as Metformin and AICAR work by stimulating an enzyme called AMP kinase (AMPK) which regulates energy within our cells, the very enzyme that hepatitis C virus represses to enable it to replicate. As per the claim by the researchers, the hepatitis C virus switches off AMPK so that the cell continues production of lipids and membranes, both of which are vital to its survival. AMPK's usual function is to conserve the energy balance in cells (it does by temporarily shutting down the production of lipids (fats) and membranes) when it senses an increase in energy requirements. Researchers claim that, when a cell becomes infected by a virus, AMPK gets activated and shuts down certain functions of the cell temporarily until the cell's energy is rebalanced.